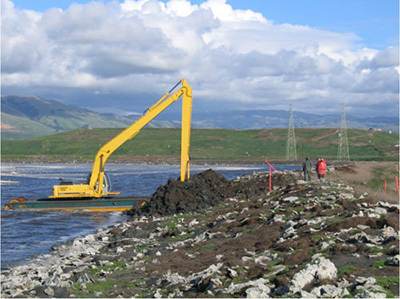 The South Bay Salt Pond Restoration Project in San Francisco Bay is the largest tidal wetland restoration project on the West Coast. When complete, the project will restore 15,100 acres of industrial salt ponds to a rich mosaic of tidal wetlands and other habitats. As communities across the Southeast United States and the Caribbean count the cost of flood and wind damage during Hurricane Matthew, a pioneering study led by scientists at UC Santa Cruz, Coastal Wetlands and Flood Damage Reduction, has quantified how much protection natural coastal habitats provide during hurricanes. Using the latest modeling techniques, scientists from the conservation, engineering, and insurance sectors studied the impact of Hurricane Sandy in the Northeast United States in 2012, when New York and New Jersey were badly hit by storm surges. The study found more than $625 million in property damages were prevented during this natural catastrophe by coastal wetlands along the Northeast coast. Without wetlands, the damage bill would be much higher for Sandy and other predicted hurricanes. Where wetlands remain, the average damage reduction from Sandy was greater than 10 percent. Experts within the study team expect that the analyses of the effects of Hurricane Matthew earlier this month will demonstrate similar protections. In Maryland, wetlands reduced property damages from Sandy by nearly 30 percent, and in New Jersey, wetlands prevented $425 million in property damages. 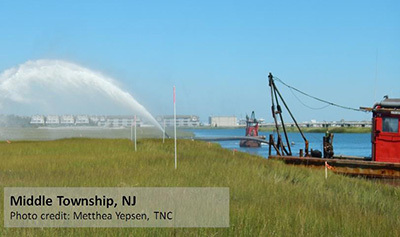 In Ocean County, NJ, the conservation of salt marshes is predicted to reduce average annual coastal property losses by more than 20 percent. (Additional findings available online here). Wetlands are critical not just for catastrophic hurricanes, but also for all the likely storms in the region. By quantifying the economic value of natural defenses, they can be more effectively included in risk models and coastal management. In fact, the protection they provide is often incorporated in industry risk models, but these benefits are often pooled with many other factors and then not clearly recognized by risk modelers, (re)insurers, brokers, clients, and others. 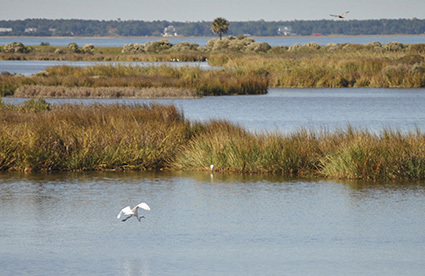 Wetlands can be straightforwardly included in results provided by the risk and engineering sectors and thus more easily considered in coastal development and habitat restoration decisions. There were also additional critical findings for coastal policy makers. For example, some townships with few wetlands within their borders benefit greatly from wetland preservation in neighboring townships; the value of wetlands to properties accumulates as you move upstream away from the coast. The magnitude of the benefits was surprising given how many coastal wetlands already have been lost throughout the region. For example, wetlands did not reduce as much damage in New York in part because of their extensive loss in past decades. At the same time, even relatively small, thin bands of wetlands serve as an effective first line of defense, and they can be restored to build coastal resilience. The study was led by UC Santa Cruz; The Nature Conservancy and the Wildlife Conservation Society in association with Risk Management Solutions and Guy Carpenter & Company. The project was supported by the Lloyd’s Tercentenary Research Foundation with additional support from the Science for Nature and People Partnership (SNAPP). Lloyd's Tercentenary Research Foundation was established to mark the tercentenary of Lloyd’s in 1988. Since then, it has funded over 100 years of academic research in the fields of engineering, science, medicine, business and the environment through the provision of post-doctoral fellowships and business scholarships. Today, through its partnership with the Insurance Intellectual Capital Initiative, UK Research Councils, and specifically commissioned academic institutions, Lloyd's Tercentenary Research Foundation continues its work of funding top flight academic research by supporting new programs of research on risk related issues. Learn more at www.lloyds.com/ltrf.